Norwalk, CT – July 20, 2010 — www.levinassociates.com, a business-to-business specialized information provider in seniors housing and health care finance, won the 2010 Award of Excellence for the website from the prestigious 2010 APEX Annual Awards Competition for the second year in a row. The publisher, Irving Levin Associates, also just announced the establishment of a company-wide reciprocal link exchange program and invites qualified companies in the seniors housing and health care finance market to apply by Clicking Here for easy instructions on how to link. According to the APEX 2010 judges, “The awards were based on excellence in graphic design, quality of editorial content and the success of the entry in conveying the message and achieving overall communications effectiveness.” There were over 3,700 entrants. 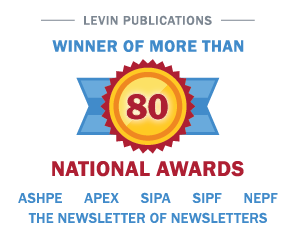 Founded in 1948, Irving Levin Associates has won over twenty-five awards in the past five years from the Specialized Information Publishers Foundation, The American Society of Healthcare Publication Editors and other prestigious organizations. Through its various publications and information services, Irving Levin Associates , based in Norwalk, Connecticut, provides investors and senior level executives in health care and seniors housing with timely and reliable market intelligence, financial news, and business strategies. The publisher invites qualified companies in the seniors housing and health care finance markets to apply for a reciprocal link by Clicking Here for easy instructions on how to link to the award-winning website.